Here's a table from the British Medical Journal from 100 years ago (16 August 1913 to be precise). It is an analysis of deaths in London in the second quarter of that year, i.e. April to June. Note that in that three month period there were 549 deaths from measles in London, including 285 in the South London districts (roughly 22 a week in South London). These included 48 in Southwark alone and 43 in Bermondsey. 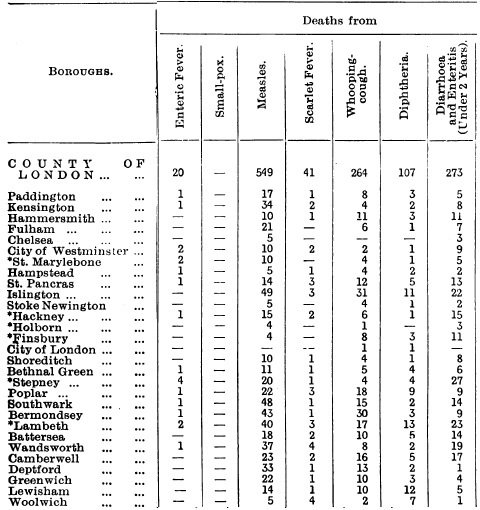 There were 33 measles deaths in Deptford, 23 in Camberwell, 22 in Greenwich and 14 in Lewisham. If you're still wondering whether vaccinating children against measles is a good idea, there's your answer. 'Parents of children, teenagers and young adults who have missed out on the MMR vaccination are urged to attend one of five special catch-up clinics around Lewisham this month to have them immunised. The MMR vaccination gives protection against measles, mumps and rubella. And with cases of measles on the rise, protection is more important than ever. Experts believe that the recent national rise in measles cases can be mostly attributed to the proportion of unprotected 10-16 year olds, who missed out on vaccination in the late 1990s and early 2000s. Lewisham’s catch-up clinics form part of a national programme to increase MMR immunisation in children and teenagers. The aim of the programme is to prevent measles outbreaks by ensuring as many 10-16 year olds as possible are immunised in time for the next school year. Recent figures show that uptake of the first dose of MMR in Lewisham is now at the London average of around 90%. However take-up of the second dose of MMR is below average at 72% and in children over five is still amongst the lowest in London. This is important because one dose may not offer full protection' (Lewisham Council Press Release, 8 August 2013).